The Philadelphia Phillies are a Major League Baseball team based in Philadelphia, Pennsylvania. They are a member of the Eastern Division of Major League Baseball's National League. In the franchise's history, the owners and ownership syndicates of the team have employed 11 general managers (GMs) and appointed 15 team presidents. The GM controls player transactions, hiring and firing of the coaching staff, and negotiates with players and agents regarding contracts. The team president is the representative for the owner or the ownership group within the front office and is responsible for overseeing the team's staff, minor league farm system, and scouting. The longest-tenured general manager is Paul Owens, with 11 years of service to the team in that role, from 1972 to 1983. Owens also served as the team manager in 1972, and from 1983 to 1984. After this time, he served as a team executive until 2003, and was inducted into the Philadelphia Baseball Wall of Fame in recognition of his services. The longest-tenured owner is Bob Carpenter, Jr., who was the team's primary shareholder from 1943 to 1972. He appointed the team's first general manager, Herb Pennock, during his tenure. In combination with his son, Ruly, the Carpenter family owned the Phillies for nearly 50 years (until 1981) until it was sold to Bill Giles, son of former league president Warren Giles. After Giles sold his part-ownership share, the Phillies are currently owned by John S. Middleton, Jim & Pete Buck, and former team President David Montgomery. The Phillies are currently overseen by team president Andy MacPhail and GM Matt Klentak. The Phillies have employed 15 team presidents since their founding in 1883, beginning with sporting goods salesman Al Reach. The longest-tenured president is Bob Carpenter, Jr., who oversaw the club for 30 years. 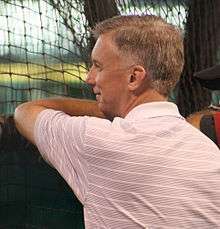 Currently, the office of team president is held by Andy MacPhail, who assumed the mantle in 2016. Ownership groups have often included the team president, but at other times, such as the tenure of Charles Phelps Taft, others were appointed to fill the president's role. Al Reach was the Phillies' first president. Carpenter, Robert 2Robert R. M. Carpenter, Jr. The Phillies' first GM was Herb Pennock, selected by owner Bob Carpenter, Jr. to oversee the team when he went into the army; before this time, GM duties were handled primarily by the team owner, and this would continue after Pennock's tenure when a GM was not present. On September 10, 2015, the Phillies announced they would not extend GM Rubén Amaro, Jr.'s contract. Amaro had led the team since 2008. Ed Wade was the ninth GM in franchise history. 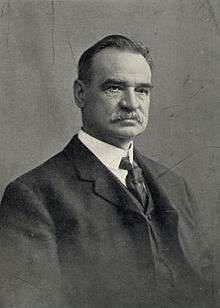 a Carpenter, as the owner, assumed GM duties after Pennock's death in 1948.
b Giles, as team president, assumed GM duties after Owens' resignation in 1983. Westcott, Rich; Bilovsky, Frank (2004). The Phillies Encyclopedia (3rd ed.). Temple University Press. pp. 365–391. ISBN 1-59213-015-1. ↑ Schwarz, Alan (December 21, 2005). "2005 General Manager Roundtable". Baseball America. Retrieved December 29, 2008. ↑ Edes, Gordon (October 24, 2011). "Here's looking at you, Theo". ESPN. Retrieved October 30, 2011. 1 2 3 "Executive Database". Baseball America. Retrieved July 23, 2008. ↑ "Philadelphia Phillies Managerial Register". Baseball-Reference.com. Sports Reference LLC. Retrieved July 23, 2008. ↑ "Phillies Wall of Fame". Philadelphia Phillies. Retrieved August 12, 2008. 1 2 Cassavell, AJ (October 24, 2015). "Sources: Phillies select Klentak as new GM". Philadelphia Phillies. Retrieved October 24, 2015. 1 2 Westcott & Bilovsky, pp. 365–367. 1 2 3 Westcott & Bilovsky, p. 367. ↑ Westcott & Bilovsky, pp. 367–368. 1 2 Westcott & Bilovsky, p. 368. ↑ Westcott & Bilovsky, pp. 368–369. ↑ Westcott & Bilovsky, pp. 369–370. ↑ Westcott & Bilovsky, pp. 370–371. ↑ Westcott & Bilovsky, pp. 371–373. ↑ Westcott & Bilovsky, pp. 373–374. ↑ Westcott & Bilovsky, pp. 374–377. ↑ Westcott & Bilovsky, pp. 377–379. ↑ Westcott & Bilovsky, pp. 379–380. ↑ Westcott & Bilovsky, pp. 380–381. ↑ Zolecki, Todd (June 29, 2015). "MacPhail to be Phillies president after season". MLB Advanced Media, LP. Retrieved July 14, 2015. ↑ "Baseball Hall of Fame Inductees". Baseball-Reference.com. Sports Reference LLC. Retrieved December 29, 2008. ↑ Todd Zolecki (September 10, 2015). "Phillies won't offer Ruben Amaro new contract". M.phillies.mlb.com. Retrieved June 4, 2016. ↑ Westcott & Bilovsky, pp. 381–382. ↑ Westcott & Bilovsky, pp. 382–383. ↑ Westcott & Bilovsky, pp. 383–384. ↑ Westcott & Bilovsky, pp. 384–386. ↑ "Paul Owens dies at age 79". Major League Baseball. Retrieved July 26, 2008. ↑ Westcott & Bilovsky, pp. 386–387. ↑ Westcott & Bilovsky, pp. 387–388. ↑ "Phillies fire GM Wade after eight seasons". ESPN. Retrieved July 25, 2008. ↑ Mandel, Ken (November 2, 2005). "Phillies name Gillick general manager". Major League Baseball. Retrieved July 23, 2008. ↑ Mandel, Ken (November 3, 2008). "Amaro Jr. takes over reins for Phillies". Philadelphia Phillies. Retrieved November 4, 2008.